The subtitle explains a lot. ‘Travels through my childhood’, Bryson takes us back to small town US, fifties style. In his case, referring to a famous first sentence of his own book: “I come from Des Moines. Somebody had to.” So strictly spoken, this is not a travel book. It could be classified as an autobiography. In Bryson’s case it is a bit of both. And I’m very happy with this book. I did enjoy his language books; I finished and found many interesting facts (most of them forgotten since) in his ‘Small history of nearly everything’. 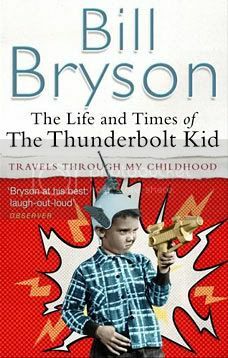 But Bryson is at his best when travelling, even like this time, travelling through time and memory. The Thunderbolt kid again is laugh out loud funny. At many moments I felt like reading out loud the passage I had just read to random strangers, just to share to delight of his writings. Stories about his school, about his neighbourhood, it gives a great impression what it was like to grow up in a country that was growing up itself. Or as quoted on the back cover: “It was a happy time, when almost everything was good for you, including DDT, cigarettes and nuclear fallout. I think, at least I hope, that some of the stories are exaggerated. I’m not bothered. I’m glad that the lazy student Bryson turned out to be a great writer, who unlike his school days, spends great amounts of time on research. To say that I am looking forward to another Bryson travel book is an understatement.